I, Pavan pandey, working with an Organization (NGO) . 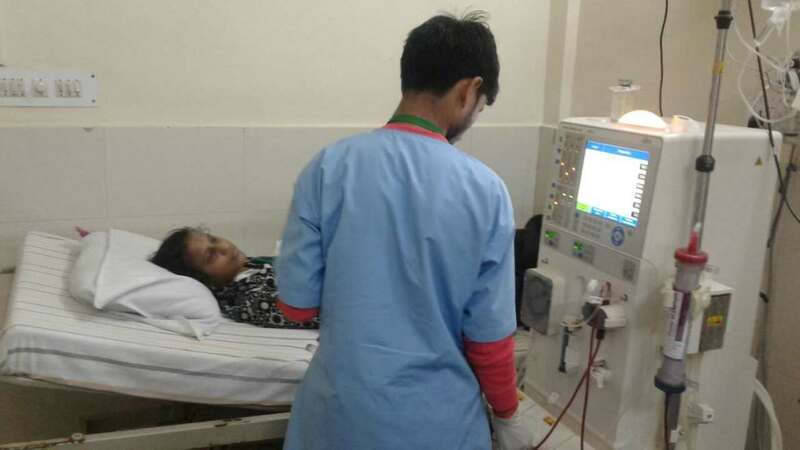 My Sister Nisha Pandey age-24 year, suffering from serious kindey disease , her both kidney have failed according to PGI, Lucknow Doctors and need kidney transplant as early as possible. Her health condition is not good and now she has become worse that she unable to eat any food (Only liquid and energy glucose given during treatment). She admitted in emergency ward of PGI, Lucknow and Doctors said only Kidney transplant is a possibility for her life .and now we came back to our house at KANPUR,UP . But 2 weeks ago she again have a problem to taken breathing at night and my family emergency admitted her in a private hospital(ABHA NURSING HOME, ICU SPECIALITY,ALLENGANJ KANPUR) in ICU, and her treatment is started . 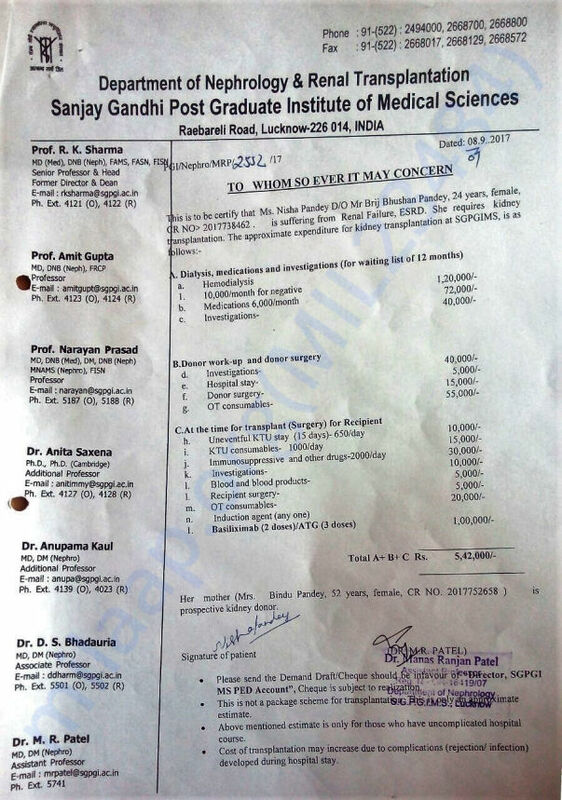 There one week she is in ICU and in her treatment till now I incurred 3,00,000/- approx and still her treatment is going on and daily dialysis is going on otherwise she has no chance to live . My family background is not good . 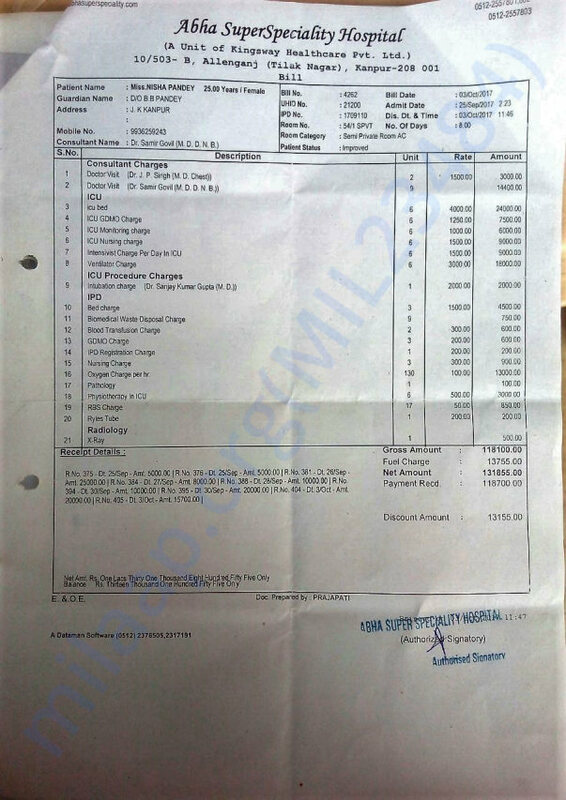 My father is working in private company and as a worker and we have not any income to continue her treatment . I am also searching for any Kidney Donor but still I am not get it. My Sister Nisha Pandey Blood Group is A+ . Unfortunately, with inexplicable grief, we're having to inform you all that that Nisha passed away. We were on the way to hospital for her dialysis and she started having a severe problem in breathing. She went completely breathless. By the time we reached the hospital, her kidneys had started failing. The doctors tried their best to revive her. Thank you everyone for being so supportive. This means a lot to us. Thank you for your kind and support in helping my sister's treatment. 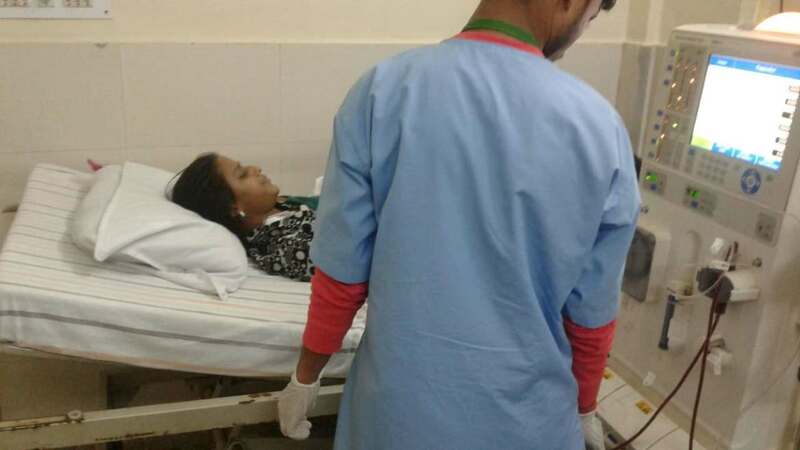 I want to share till my sister NISHA condition is not well but we can say that 2 to 5% recover before day, still need more treatment and funds for the same. We still have not identified any donor who has A+ blood group. 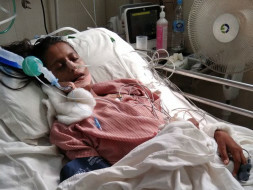 Nisha is going to dialysis twice in a week otherwise she can't survive and our financial condition is not good to do it . So humble request to you please support and bless her for live healthy life. Here is an update on Nisha. Thanks for your support given through this platform and thanks to all who supported this campaign. I want to share that my sister's condition has been improved a little. But the kidney problem is same as before and is undergoing dialysis thrice a week. Requesting to you please continue your support and if you know any kidney donors, please inform. Wish well and pray for your successful operation and fast recovery.